Moringa Oleifera, commonly known simply as Moringa. Moringa is one of eco-friendly plants that help the world hunger and sick people. It is a soft-wooded tree that grows to about 20 feet tall, with corky bark and small feathery leaves. Its root is just like a Japanese wasabi or horseradish. Moringa is entirely edible, from leaves to roots. The moringa plant is drought resistant and grows practically anywhere around the world—even lands with poor soil, near the sea and dry areas, and can even withstand severe drought once the plant is established. Seeds sprout readily in one week. Alternatively, one can plant a branch and within a week, it will grow by itself with another sprout. It is often cut back year after year in fence rows and continues to thrive. Therefore, to keep an abundant supply of leaves, flowers, and pods within easy reach, topping out is useful. Of course, it is natural and understandable that water and fertilizer make it grow better. The leaves contain significant sources of minerals and vitamins A, B, and C. It contains high levels of calcium, phosphorous, iron, protein, with low fat, and low carbohydrates. Its iron content is very good for anemia. We like to believe that if we will plant moringa tree in our backyard garden as well as all vacant lots around the world, there shall be no food shortages and malnutrition problems. According to other sources on the internet, Moringa has seven times the vitamin C in oranges; four times the calcium and two times the protein in milk; four times the vitamin A in carrots; and three times the potassium in bananas. Virtually every part of it is edible. 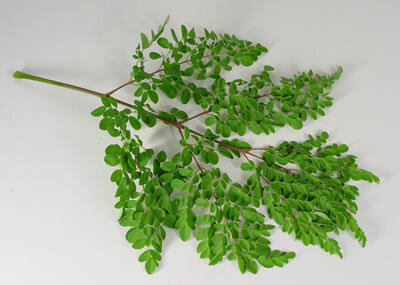 The Moringa leaves are also eaten as a leaf vegetable, particularly in the Philippines, where it is called malunggay. It can be cooked in any various ways like that of spinach. The roots can be pulled out and can be used as horseradish. Flowers can be eaten as vegetable, or you can use it to make a tea, and it provides calcium and potassium. From its seed, quality oil called Ben oil is yield by pressing. The oil is good for cooking and lubricating precision machines such as watches and sewing machines. So why I became interested in planting moringa? During the 1940s, Japan suffered from food shortages. We used desiccated coconut powder as bread flour mixed with edible grass powder. I can remember how moringa leaves were dried and powdered to make a bitterly tasting bread just to survive from hunger. However, it was good that moringa provided hungry Japanese with enough nutrients. How did we make bread out of moringa leaves? At first, rinse moringa leaves and boil it for 4-5 minutes. Then, dry it either under the sun or windy shade. Grind it and mix with any flour to make cake, bread, or noodles. This makes a highly nutritious daily meal. The above photos are Moringa and the author, Mr. Takano. 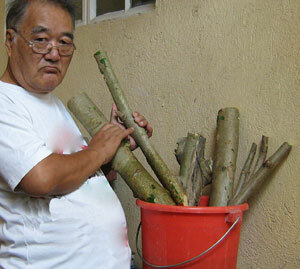 This photo shows the author, Mr. Takano, and 6 pieces of small and big cut Moringa tree branches, about 18-20 inches long. 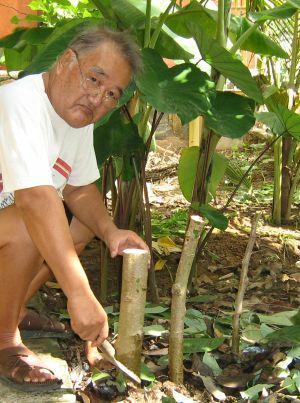 Mr. Takano planting big and medium cuts of Moringa in his backyard garden. 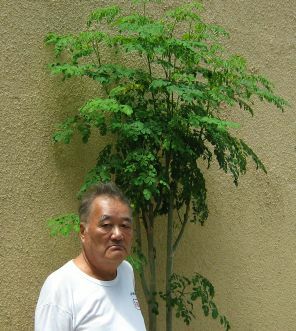 Left photo shows 3 pieces of Moringa tree, planted in the garden by Mr. Takano himself. New sprouts will be seen in a week time. The leaves and flowers are nutritious and helps especially for children's growth. Leaves can be dried and powdered, and mixed with any flour to make nutritious cake and bread. Fresh leaves are cooked just like any other vegetables, or be grinded for juice extract. It is recommended that the juice be boiled for a minute to remove some bitter taste and vegetable smell. Boiled juice is mixed with milk and honey or sugar. Our PYRO-ENERGEN staffs cook the grinded leaves with chicken to make a good, tasty, and nutritious soup practically on every daily meal. Oh, that's because our office fence is surrounded by plenty of Moringa trees. The ben oil from the seed can be extracted by pressing or mashing it and boiled with water. Boiling it will make the oil float to the surface of the water. Scoop it and you can use it as an excellent cooking or lubricating oil. Now, do not throw the mashed seed. You can use it for treating polluted water. According to the old folks and traditional healers, if eaten, grinded seeds are good for detoxification of heavy toxic metals in the body, although we do not have any clinical data for it. But certainly, it is way better than those fake foot detox machines sold worldwide. Moringa seeds are also used for water treatment. 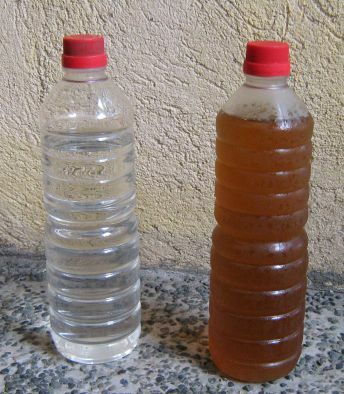 As seen in the photo below, the right PET bottle shows artificially made polluted water out of kitchen wastes. When kept with grinded moringa seeds, the dirt contaminated in the water settles after a few hours as seen in the left PET bottle. Moringa's seed can remove hazardous materials from water. The use of Moringa for body detoxification is also being studied by several research groups. According to some scientists, there are several ways to improve the process of water treatment with the Moringa seed. Dried Moringa seed is grinded or mashed to extract Ben oil (the seed can be used for water treatment even after the ben oil is extracted). The ratio of seed and water depends on the purification quality and speed. 100-200 seeds to a liter of water are recommended. Note that bacteria cannot be eradicated by the moringa water treatment. Moringa is galactagogue, rubefacient, antiscorbutic, diuretic, stimulant, purgative, antibiotic, and antifungal. What more could you ask for? It is really a fantastic and a wonder plant. The Moringa seeds offer a relatively high yield of 36% Ben oil. The oil contains: 65.7% Oleic acids; 9.3% Palmitic acid; 7.4% Stearic acid; and 8.6% Behenic acid. The seeds are good for hypertension, gout, asthma, hiccups, cancer, body detox, and anti-aging. It also helps in increasing sperm count. Oil extracted from Moringa flowers can also be helpful for arthritic pains, and rheumatic and gouty joints. Its leaves are also used for hiccups, asthma, gout, backache, rheumatism, and skin wounds and sores. Moringa leaves are believed to increase the flow of mother's milk, and good for constipation, ulcers, diabetes, and for stabilizing blood pressure. Moringa contains a compound known as Pterygospermin. It has powerful antibiotic and fungicidal effects especially for skin infection. It helps slow down skin aging, too. Moringa contains antiseptic and anti-inflammatory properties effective for chronic swelling as well as trauma. Traditional healers may know more about the effectiveness of these herbs. Proper use of moringa is therefore an excellent eco-friendly solution for the world. Now, you can call Moringa Oleifera an eco-friendly miracle tree of the world. Let us save the world from hunger and from sick people. 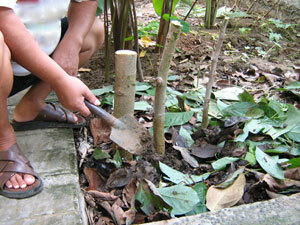 Let us plant Moringa, today!